These blooms are now gone, but were too pretty not to share. 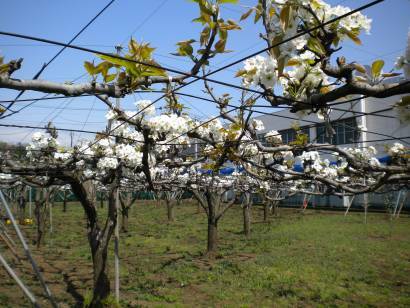 The young nashi (pears) are forming under the green leaves that fill out more and more every day. What's interesting about this orchard is that it is near our apartment in Tokyo, and is clearly a remnant of the farms that used to dominate this area. Two old farmhouses still stand just north of the pears with fields in production and an accompanying chestnut orchard. It's also just a block or so away from a bike path with a favorite vegetable stand on it, and a major road. Bees must now wing their way over a small factory, a school, apartment buildings, and houses rather than former fields and forests. Japanese pears are not as sugary sweet as their American counterparts, nor are they as soft and squishy. About the size of a softball their texture is more like that of an apple. They are lovely alone, in oatmeal, granola, with yogurt, and in salad. I'm also betting they'd make a great jam, which is on the agenda for this fall. Are they also called Asian pears? Or as my son refers to them, "apple-pears?" If so, we LOVE those. I like the crunchy texture better anyway. 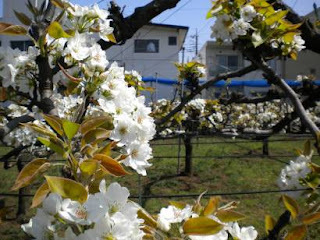 I have two traditional pear trees in my garden-the blooms in your pictures look very similar to mine. Unfortunately, I haven't been able to eat any pears off my trees: wasps and worms seem to get to them before I do. Good luck with the blogathon! I'm also a blogathoner-trying to step up my game! Anjuli, I can't say I've noticed the cicadas, but I also didn't know this was a nashi orchard until just recently. I'll keep my eyes open - or may ears, as the case may be. Kiwi orchards abound, as well, and we've been munching on those lately. Wow, what lovely pictures! I just had Asian pears for the first time a couple of weeks ago, and they are so good. My husband loves this pear jam that we buy from a local vendor, so I may try to make the jam with Asian pears for him. Thanks for sharing! Thanks, Jen! Let me know if you try to make jam. I'll look forward to seeing a recipe on your blog!